When printing light coloured inks directly onto dark coloured garments with opaque color inks, like plastisol inks, the colors lose their intensity. To get around this, it’s best practice to first print a layer of white ink, known as an underbase. The underbase is printed first then dried to the touch with a heat gun or flash-curing machine before the rest of the color screens are printed. By using this method the colours will hold their vibrancy. 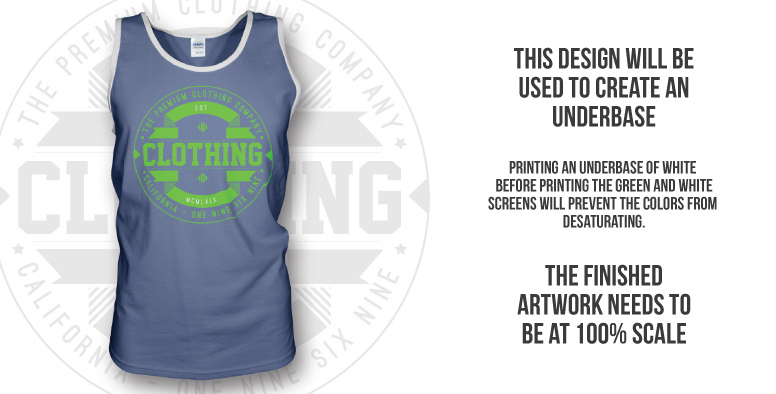 When screen printing multiple colors it can be very hard to align the print areas of each screen perfectly, even if the screens are aligned perfectly the white ink underbase can bleed a little, you would then see hints of white where there shouldn’t be. For this reason the underbase artwork is reduced in size slightly, this is called “choking” the artwork. Choking the underbase gives the screen-printer a little bit of room to completely hide the underbase so it’s invisible to the naked eye. You can’t just go and resize the artwork to 99% scale, if you were to do this, any internal details would be misaligned. What we need to do is contract every line that makes up the design by adding a stroke of 1pt. 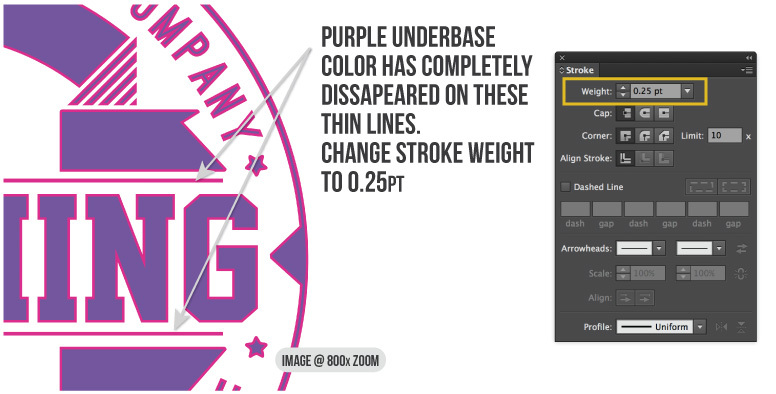 In Illustrator, strokes are added to the diameter of the object, however the stroke is expanded from the center of the stroke. See the diagram below for an example. 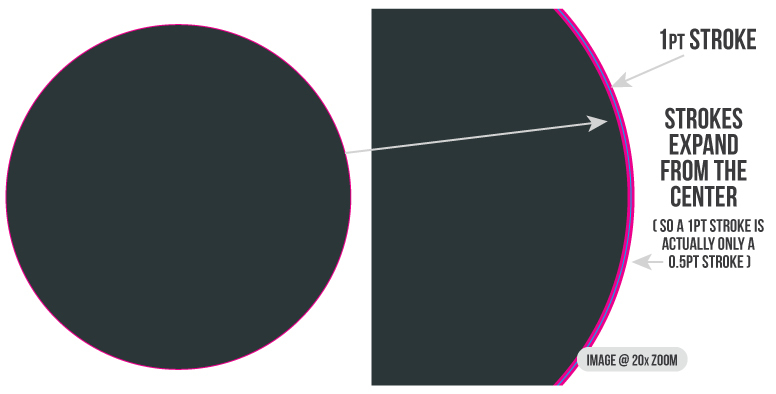 Since the stroke expands out from the center of its line we are really only adding (or minusing) 0.5pts from the diameter of our artwork. 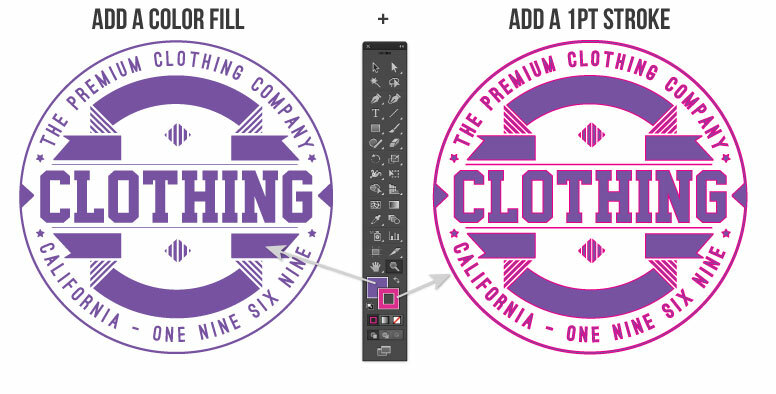 In this tutorial we will be using a magenta color instead of the usual white color so you can actually see the stroke being applied. Once the underbase artwork is created we would normally set the stroke color to white so that all is left is the black “choked” area, it would now be ready to be printed onto transparent film for the next stage of the screen printing process. Note: A downside to printing an underbase layer is that it is another layer of ink (obviously) this will add to the hand feel especially for plastisol inks. Alternative inks can be used to reduce the hand feel and need for printing an underbase, see our info post on the differences between Plastisol, Waterbase and Discharge inks. 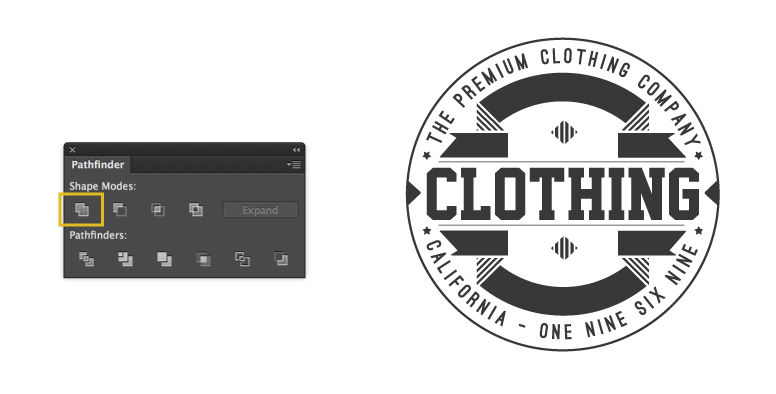 We will be using a t-shirt design from our Round Badge Designs – Vector Pack as the sample artwork for this tutorial. IMPORTANT! 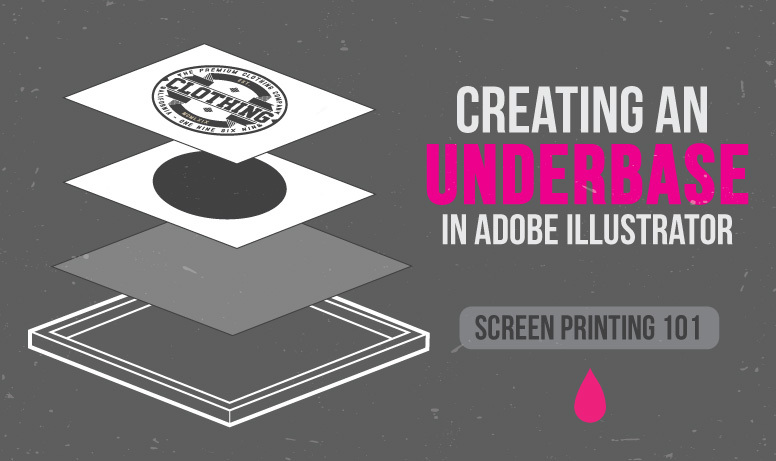 Before making the underbase, the artwork needs to be the exact size it is to be printed onto the garment. Now we need to make all of our artwork one solid shape. With the newly expanded paths still selected, click on the Unite button of the pathfinder menu. If the menu isn’t on screen, choose Window > Pathfinder. At this stage, we like to change the color of the underbase to ensure that we have combined all paths properly. If you change the color of the main artwork and you notice some sections of the artwork remain the same original color, then we know we need to re-select all our artwork and hit the Unite button again in the pathfinder. Add a 1pt stroke to the artwork. Sometimes adding a stroke around a thin line will render the line invisible (like we mentioned above, strokes expand from the center). 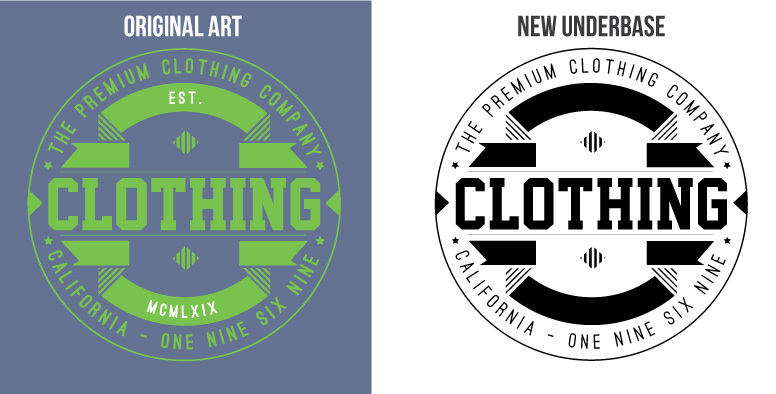 In our artwork example there are two thin lines either side of the clothing text. As you can see in the image below, you can no longer see any purple sections of the line, only magenta, since the magenta sections will not get printed in the end, no purple sections will mean that no underbase will be printed there. In these instances we will need to change the line thickness from 1pt to 0.25pt. 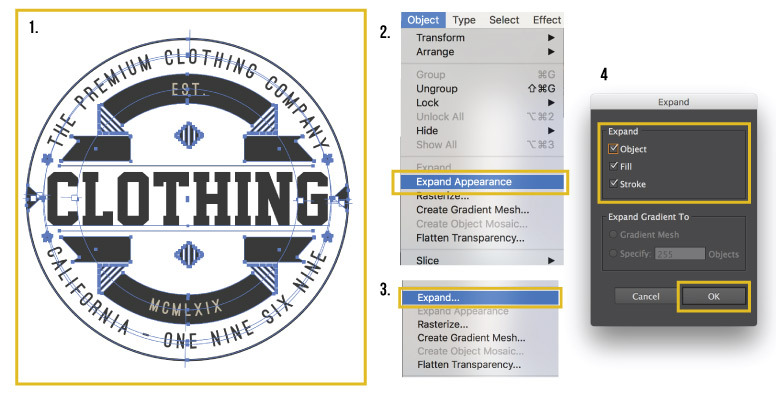 Use the direct selection tool (white arrow, shortcut key – A) to directly select the thin lines.